Working with a large code base in a large distributed team involves a lot of challenges. You need to deal with complex workflows, slow build times, communications across different timezones, etc. In this talk, Yusei will share how development teams can tackle these issues and speed up daily development. This talk will also cover the following topics: Workflow automation with Fastlane; code review with Danger and SwiftLint; collecting and visualizing code metrics with InfluxDB and Grafana; build time reduction; and code modularization. My name is Yusei Nishiyama. My talk is about building for iOS at scale. I work for a company named Cookpad. It is the largest recipe sharing service in the world with the aim of making everyday cooking fun. We cover 67 countries and 21 languages, and we have about 100 million users all around the world. There are 10 iOS developers. Four in the U.K., four in Japan, one in Lebanon and one in Colombia. Working on an app that supports users all over the world in a distributed chain involves many challenges. I will talk about working with a large team and working with a large code base. The first part of the talk covers Fastlane, Danger and code metrics. The second part covers build time reduction and code modularization. If you work in a team, you may have issues that you never have when you work alone. For example, someone broke the build, and the rest of the team does not know how to fix it properly. Or perhaps someone’s vacation may prevent the team from making a new release because only one person has the distribution certificate. Generally, you can deal with those common issues with continuous integration (CI) and automation. None of those tasks should be developer dependent. Continuous integration should consist of several subsystems. This is an overview of our CI system: The diagram starts from the point where a developer pushes their change to GitHub. GitHub triggers a Jenkins job through a webhook. 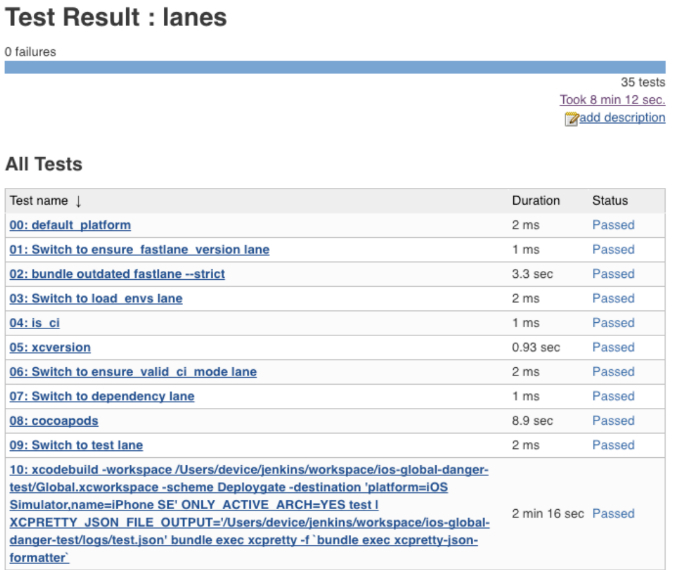 Then Jenkins executes a Fastlane script. Fastlane is a suite of tools that make it much simpler to automate mobile developers’ daily chores. You can define your custom workflow in a text file called a Fastfile. We have seven Fastfiles which have 28 “lanes”. Fastlane is now very popular among mobile developers and you might have been familiar with some common use cases like running tests or uploading your app. Our server also automatically builds up and distributes the app to testers for every push to github. But there are some changes that you may not want to distribute to testers - for instance, documentation updates because it simply wastes CI resources; we distribute a better version only when a pull request is labeled as “beta distribution”. desc "Check if pr is marked as beta distribution"
desc "Get labels of pull request"
Those lanes in the example fetch labels from a specific pull request and check if they contain a beta distribution label. 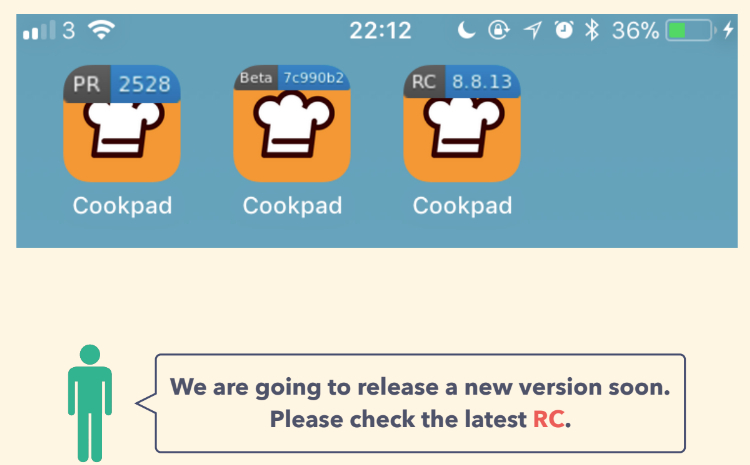 At Cookpad, each push triggers a beta distribution to internal testers. Members of a company should be some of your best users, and their feedback is really valuable. Unfortunately, because pushes can happen automatically, and a lot of developing features are occurring in different branches, if we developers don’t communicate with testers well, they stop giving us feedback because they can’t know what we want them to test. Before talking about Danger, let me ask a question. Have you ever posted a nitpicky comment such as “please remove your parentheses surrounding the condition”? Something like this should be done by a machine automatically. This is where Danger comes in. One important to note is that you can execute Linter through your Dangerfile. Danger can comment on your pull request on behalf of you, and warn about rule violations. This way, you no longer need to spend your time on minor styling mistakes, like saying “please remove TODO before merging the branch” or “this line exceeds the character limit”. 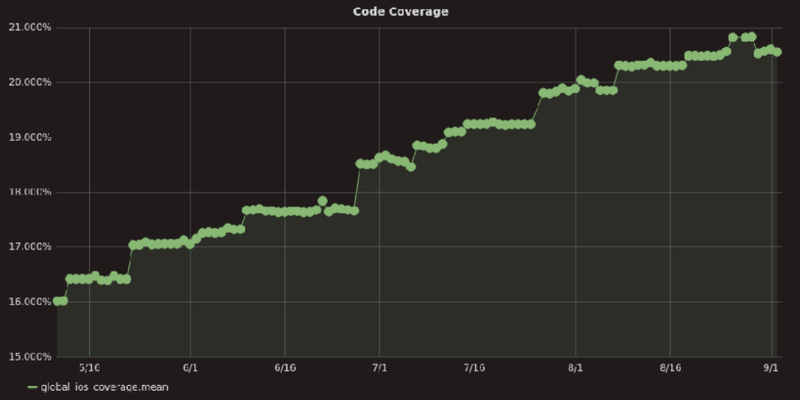 Our system is unique when it comes to code metrics. We collect our code metrics in a database which is called InfluxDB. InfluxDB is a data storage which specializes in time series data. It has a built-in HTTP API and a lot of client libraries in many languages. It’s very easy to integrate InfluxDB into your build system. It’s written in GO, so it’s really fast and responsive. We have a Fastlane script which collects code coverage and posts the data to InfluxDB. Those data is read and visualized through Grafana. Grafana is a metrics dashboard and editor that supports InfluxDB. Here is an actual change in our test coverage, as visualized in Grafana: If your metrics are visualized and accessible, everyone can be aware of both the good and the bad things that are happening on your team. That’s why visualization is really important. We also utilize InfluxDB and Grafana to measure other metrics such as the number of issues and number of pull requests. 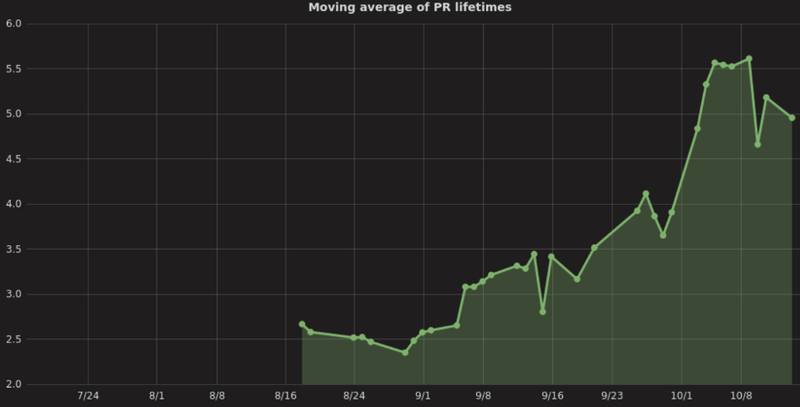 We can use that data to see how productive our team is, and how stable our app is. This helps because we can set a clear goal. We can say we have number x and we should target number y. Hit the run button to check whether it’s working as you intend. You find a bug in the layout. You fix that and then run it again. Unfortunately, you find another bug which only occurs on a specific version of iOS. You fix that bug, and then you push the change to github. Your CI server starts building your branch and launches tests against it. The CI fails due to a failing test. You fix it, run the test locally, then push the change to github. Then you need to wait for CI again. When your codebase is large, and the size of your team is big, the above example can present a serious issue in regards to building. There are techniques to measure and improve Swift build time. I will show you how to improve the Swift build time and gain productivity in two parts: measurement and improvement. If you want to improve something, you should start from understanding the problem. The first thing you could do is enable the ShowBuildOperationDuration flag. It displays the build time in Xcode, so that you can always be aware of this. However, it’s not enough. The build process can be broken down into multiple processes such as dependency management and compilation of each source file, and you may run Linter and Formatter in a run-script phase. You need to know how long each process takes to identify the exact bottleneck. You can further break down the compile phase into the compilation of each function. An easy way to find a function which takes a long time to compile is to enable frontend-warn-long-function-bodies flag. If you turn the flag on, Xcode warns you of functions that have long compile times. For example, I set the threshold to 100 milliseconds, and Xcode complained because a function took 15 seconds to compile. You can also let the compiler print out how long each function takes to compile by using the frontend-debug-time-function-bodies flag. You can play with the data just by copying and pasting it in your terminal, but that is not tooling friendly. The extension of the log file is .xcactivitylog - it is just a gzip file, so you can unzip it and read it in plain text. It gives us a chance to consider if there’s any other way to write this function in a compiler-friendly way. In this section, I will show you how the build time was improved with real data from a real application. This application has 40,000 lines of Swift code, so it’s a medium-sized app. CocoaPods is used as a dependency management tool; it has 38 direct dependencies to pod library and ends up installing 60 libraries. To start, it took 48 minutes to test and archive on CI. The easiest but the most effective technique to fix this is to start with Whole Module Optimization. With it, the Swift compiler compiles all files in the module at the same time. The intended benefit of Whole Module Optimization is to let the compiler optimize code more aggressively. There’s a hack with which you can tell a compiler to compile the whole module at once, but without any optimization. You can try this by setting optimization level “Whole Module Optimization” and specifying optimization level “none” in the “other” Swift flag: You can find more discussions about build time reduction using this technique. Whole Module Optimization without any optimization may sound weird, but it makes the build time really fast in most cases. With that setting, now CI takes less than 20 minutes to test and archive. The build time improved, but it could be better. You really do not need to build the entire app every time with Playgrounds. Playgrounds is more than an Apple environment because it can render views, and we can use Playgrounds as a powerful prototyping tool. 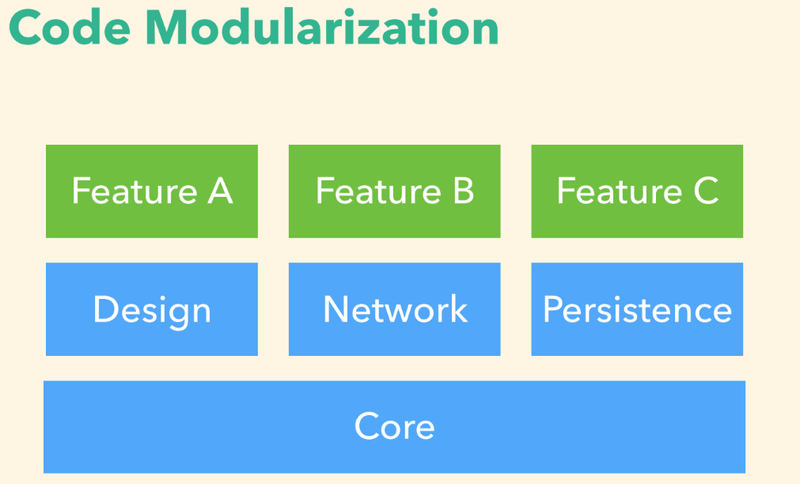 Code modularization is the idea of having separate modules for each purpose. In 2014, James Lewis proposed the microservice architecture. This is an approach to develop a single application as a suite of small services. It does not completely correspond here, as the idea relates to web applications, but we can get similar benefits from it. If you apply the idea to apps, you will get this kind of architecture: You have a core framework consisting of a design framework, a networking framework, and a persistence layer, and you can build each feature on top of those core libraries. The benefit of code modularization is more than just keeping your project cleaner. As the default access level of Swift is internal, everything you put into your framework is private from other frameworks by default. It gives you more opportunities to consider which methods and properties should be public and which should be private. Another benefit is that you can get a faster incremental build time. A change you make to a module doesn’t trigger a re-build of other modules. So it could improve your incremental build time dramatically. Another thing you could get from code modularization is autonomous teams. As organizations expand, it’s hard to synchronize teams with each other. It can take months to get a stable version because it’s really hard to make sure that a change to a feature doesn’t break any other features. When there are clear boundaries between modules, people can focus only on the individual modules that they are working on without being concerned about what others are doing. To make your app modular, put all of your developing frameworks into a single repository. The main benefit of this approach is that you don’t need to change your workflow. You can work with your frameworks as you did for a single monolithic application. The downside may be that those frameworks are not ready to be open-sourced. You can also manage your frameworks in different repositories. One obvious downside of the approach is that it makes your workflow more complex. Imagine developing a new feature which requires changes to your main application and changes to your framework, say the networking layer. Then you may need to submit two different requests. One is to your main application, and one is to the API framework. This obviously makes your workflow more complex. Next is to consider dependency management. I will compare four possible approaches: CocoaPods, git-submodule, Carthage and gitsubtree. CocoaPods has been a de facto standard among iOS developers and is still one of the best dependency management tools. The only thing you need to do is to define dependencies in a Podfile, and CocoaPod manages everything else. To put it another way, there are a lot of things happening under the hood, which makes things harder when you face a problem. Strictly speaking, git-submodule is not a dependency management tool. It just checks out dependent repositories for you, and everything else is up to you. However, additional complexity is introduced in your workflow because every time you make a change to your framework, you need to update the reference in the parent repository to point to the new commit. Carthage is a middle ground approach between CocoaPods and git-submodule. You define dependencies in a Cartfile, and Carthage downloads them for you, but how to link them is up to you. Carthage also pre-builds libraries, so Xcode doesn’t need to compile and index them, which saves a lot of time. One thing you must be careful with is ABI (application binary interface ) stability. At Swift, ABI stability is not yet available; all your previous frameworks must be built with the same version of the Swift compiler. Git subtree is less popular than the other three. It clones the sub-project, and merges it into the parent project, so you can make changes both to the parent project and the sub-project in the same place. When you push those changes, git subtree goes through the commit, picking the changes that should go to each sub-project. With the magic of git subtree, you can do your work as if you are in a single repository even though it is actually backed by multiple repositories. The pros and the cons are mostly the same as with git-submodule, but one significant advantage is that you don’t need to change your workflow. A downside is that you need to use the slightly tricky merging strategies of git subtree, or you can wind up with a serious conflict or dirty git history. There’s a medium post that explains how a team modularized their code using git subtree. I highly recommend that you read it!. If your app is a huge, monolithic application, then code modularization is not a simple task. Once you decide to do this, you should start from a single repository, because at the beginning of the process your frameworks are probably not very stable. Then, after a while, when you get to the point where your framework is not changed very often, you can consider separating them into multiple repositories, and use previous versions of them. A common pitfall with code modularization is dynamic framework loading time. You can check how long dynamic library loading takes by enabling the DYLD_PRINT_STATISTICS flag. If an app takes very long to open, the system queues you up. Some people work around this problem by merging all the frameworks into a single, dynamic framework, and link that into an application, but this is not a very simple solution. Dynamic library loading time was the only concern in moving this idea forward, and it seems that even Apple does not encourage it. So I was undecided about this approach for a while. However, my concerns have recently vanished, because Xcode 9 started supporting Swift static library targets. 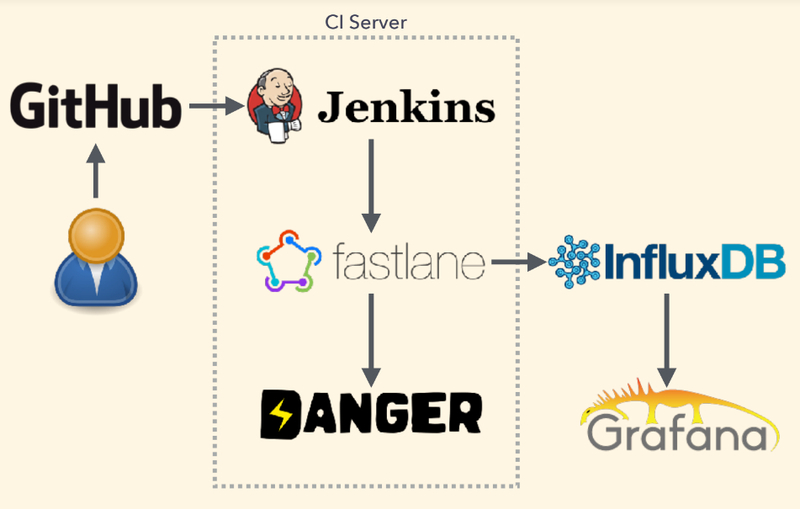 Automating your daily workflows with Fastlane, CI, and Danger saves you time for code review. Visualize everything you want to improve. Revising project settings may improve build time. Code modularization improves build index time and helps you to maintain a well-structured team and code base. Yusei Nishiyama is a senior iOS developer at Cookpad the largest recipe sharing service in the world with the aim of making everyday cooking fun! He majored in philosophy and aesthetics but the beauty of programming languages led him to become a programmer and he has now been working with iOS since 2012. When he isn’t coding, he is spending some time listening to and making music. You can find him playing jazz piano in a pub.